When you’re buying a house, do you consider the fiscal position of the locality? When representing buyers, I advise that they analyze the budget of the homeowner’s association – to look at the debts, expected capital expenses, monthly fees – shouldn’t you do the same for localities? Arguably, local governments have an equal and in many cases more significant impact on homeowners’ lives and property values – schools, fire and rescue, transportation infrastructure, snow removal … what happens if the tax rate rise so dramatically, and the budget becomes unmanageable? As a prospective buyer, shouldn’t this be part of your buying analysis? Currently the real estate tax rate in Fluvanna County is $0.54 per $100 of assessed value; the County is proposing a four cent increase in the tax rate in 2012 … and calling for a $1.22 per $100 rate in 2016. At a Board of Supervisors meeting on Wednesday night, Fluvanna County Supervisors discussed their dire five year financial outlook, calling the situation “sobering” and “a perfect storm”. The total expenditures were estimated over the five year forecast to increase from $60.6 million to $71.4 million. Revenues aren’t expected to increase. The forecast anticipates total property in the county to lose value in a reassessment. With the pending reassessment, the audit calls for a fiscal year 2016 real estate tax rate of $1.22 per $100 to meet all expenditures and capital improvements. This anticipates property values decreasing from $3.01 billion in 2011 to $2.6 billion in 2016. The tax options were part of a larger FY 2012 budget proposal that currently calls for a four-cent increase in the real estate tax rate, to $.58 per $100 of assessed value. However, the current budget keeps school funding at current levels and does not take into account a potential 1.3 million shortfall in state assistance. No pay increases are planned for county employees. Fluvanna County – During the study period (1990-2009), Fluvanna more than doubled in population (114%). Correspondingly, school enrollment in Fluvanna County increased nearly 75%. The rate of increase in both population and school enrollment was the highest in the region. 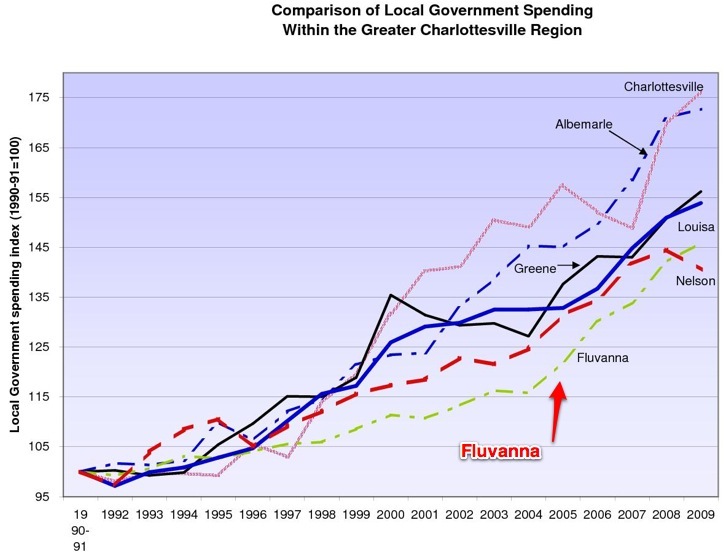 With an increase of 23.96 points, Fluvanna is second only to Albemarle in LGSI (Local Government Spending Index) growth since 2005. The rural nature of Fluvanna County (93 persons per square mile) is likely also a contributing factor to the low LGSI.